Machine is suitable to fill upto 700-900 cups per hour, of 100 cc. to 500 cc. The machine is designed with splash proof filling nozzle. • Filling speed is adjustable to avoid tail/Splashing of the product. 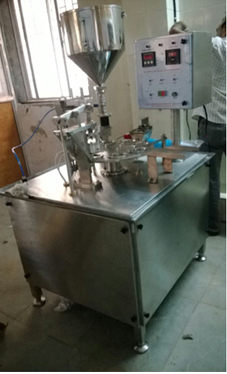 • Filling quantity can be adjusted with help of time base flow control device. All contact parts are made of SS-304 or food grade material. • NOTE: Output depends upon product, quality of cup and foil. • Round Cup : Max Rim 75 mm & Height 90 mm.